The Master of Science in Teaching (Earth Science) graduate program has been housed in the Department of Geological Sciences since 1975. In recent years the program has undergone a renaissance due to several factors. Among these are the development of an Ohio State Department of Education science model tracking the national science education standards in content and inquiry, and the development of a series of competency tests given to all Ohio K-12 students at several grade levels that include a significant number of Earth/Space science questions. Collaboration between faculty in the Colleges of Science and Mathematics and Education and Human Services has resulted in the redesign of existing courses and the development of new courses that are aligned with the national science education standards for content, inquiry, and professional development of K-12 teachers. Restructuring of the program also included the development of on-line courses, evening hours for on campus course offerings, and summer field-based courses. K-12 educator participation in this Master's level professional development program has positively impacted departmental graduate enrollment figures, increased their understandings of science and technology, and enhanced the teaching of all sciences in their classrooms. I ask my first-year physical geology students to write an essay examining the Crustal Displacement hypothesis (Flem-ath and Flem-ath, 1995), a hypothesis that is inconsistent with the accepted understanding of crustal and mantle processes. The assignment involves designing a test of the hypothesis, based on the material covered in our discussion of the theory of plate tectonics, and of how the theory evolved. 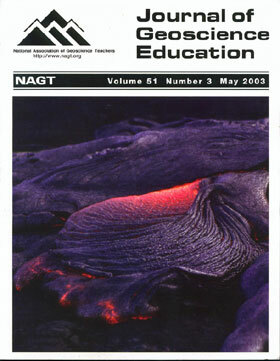 The assignment is useful because it forces students to solidify their understanding of plate tectonics by applying their knowledge in a new context, teaches them about the process of scientific reasoning and the need for objective analysis of all hypotheses, and gives them practice in critical thinking. This type of assignment could be applied to many comparable pseudoscience hypotheses in a wide range of geological disciplines. Testing the Waters: Can You Involve Community Action in your College Curriculum. The Maury River alliance (MRA) was developed at Washington and Lee University (W&L) as a cooperative program involving local colleges, high schools, government agencies, and conservaton groups. The MRA is a mostly volunteer organization (42 volunteers currently) that samples the Maury River and its tributaries, including the urban stream flowing through campus. Its purpose is both to serve the community and to provide students and faculty with research opportunities. We are addressing the connection between land use and water quality with a creataive merging of technical, social and educational aspects of local watershed management. During the first year and a half of the program we have developed a baseline water quality for low flow conditions. We have observed that water quality degrades as the river passes through the county, especially with the addition of urban and agricultural tributaries. Nutrients and bacteria are of greatest concern, with storm water high in heavy metal concentrations. In addition to exposing students to a community effort, the ultimate interest for the faculty is to focus on the scientific results. The proximity of the study site to the school and the large numbers of volunteers involved in the project contribute to the success of the project. These numbers facilitate the collection of large data sets and a plethora of research possibilities yet also present a challenge of organization and management. While professors focus on data analysis, students (and now a recent graduate as director) have acted as managers of the program, thus furthering the educational opportunities. Facing declining enrollment of geology majors and the unappetizing possibility of becoming a low-enrollment program, many geology departments have reinvented themselves as purveyors of service courses, some as major purveyors. Service courses usually focus on the environment, earthquakes and volcanores, dinosaurs, the oceans, and so forth. Assuming eventual success with a service course, the next step in the evolution of undergraduate science teaching is not necessarily clear. How does one deal with a course that becomes rather more than mildly successful? Age of Dinosaurs at the University of Texas at Dallas is presently capped at 200 students per semester. A compressed summer version is sometimes offered. These numbers are large for an earth science course that also includes a labe and a major field trip. Classrooms overflow, labs are overwhelmed, field trips unfold like invading armies, and testing methods are inadequate. Alarmingly, cheating can become all but impossible to manage in packed classrooms. Add a burgeoning push for asynchrononous instruction and the accustomed course mechanisms are rendered ineffective. What to do? Modify (or abolish) lectures. Change testing styles. Adopt new lab and field trip strategies. By all means, look to web-based course management software for solutions. Teaching students to think critically remains a significant goal of science education. In my recent introductory Historical Geology class, I used the evolution-creation controversy as a means to introduce students to the scientific method by having them write a paper that summarized the arguments used by those who took a viewpoint opposite to their own. The original plan was to have a second paper in which students attempt to refute all the arguments in their first paper (and hence argue for their original view), but the quality of papers was so variable that the design was modified so that students were then asked what they learned through the exercise. The results indicate that most students learned about the controversy and focused their views on where they stood. Only four of sixteen students did not change their views, although those students who were more extreme in their views were less likely to change their views significantly. Almost all students explicitly stated that they valued the learning experience and being forced to critically evaluate their own views, even if it was a painful exercise. Creationism, supported even by some scientifically informed people, remains an enduring challenge to education in geoscience. Intelligent design is only the most recent attempt to give creationism scientific credence. Scientists typically argue that creationism is religion masquerading as science, but this tactic has not been effective. The failure of creationism lies in the Bible itself. Although creationism has ancient antecedents, American creationism stems from 16th century Protestant dogma which has its basis in John Calvin's "sola scriptura" and the claim that every word of scripture is literally true. Calvin's Commentary on Genesis is a useful resource for scientists interested in exposing creationism as theologically as well as scientifically invalid. The Protestant Reformation separated empirical science from Biblical studies and religion. Pre-Reformation biblical scholarship credits secondary causes and operation of chance in nature, and interprets Genesis in non-literal terms. This scholarship shows that modern science actually has roots in pre-Reformation exegesis. Scientists can use the Bible along with the geological record to demonstrate that creationists claims with regard to earth history are false. A paleontological field discovery known as the Big Pig Dig has developed into a significant visitor education and research site. Between 5,000 and 10,000 visitors stop by the site each summer. The site contains many visitor facilities, including a site shelter, wayside exhibit, site bulletin, demonstration casts and a visitor interpretation program. These are useful tools for communicating to the public, the importance of protecting paleontological sites and promoting paleontological research. Site excavation, documentation and visitor interpretation, are completed by graduate and undergraduate geology students enrolled at the South Dakota School of Mines and Technology and other Universities around the United States. The namesake for the site, an ancient pig-like mammal called Archaeotherium, is preserved along with horn-less rhinoceros, the three-toed horse and several other early mammals. Both paleontological and sedimentological evidence indicates that the Pig Dig was a watering hole. The site has provided a significant amount of information on a unique depositional environment preserved within the Oligocene White River Badlands of western South Dakota. Support for implementing science inquiries in classrooms. The program goal was to help experienced science teachers do inquiry-based science in their classroom. The pilot group were experienced, successful teachers, traditional in nature, have not done inquiry prior to the program but expressed interest in learning how to do successful inquiry. Four domains composed this research agenda. The student's science learning from teacher-designed, inquiry-based instruction, including conceptual knowledge, reasoning, and the nature of science. The project objective was to investigate the teacher's attitudes about their readiness to implement an inquiry and to determine whether they actually were able to implement a meaningful student inquiry. In 1859, J.W. Dawson published a paper in an obscure Montreal journal, the Canadian Naturalist, giving the results of an investigation of Canadian limestones, using microscopic examination of thin sections. The paper includes several micrographic drawings. This paper appears to be the first thin-section study of any rock published in North America. Both Dawson and Sorby, who earlier published a thin-section study of a silicified British limestone, indirectly learned the technique from William Nicol, a teacher of physics at Edinburgh University. An investigation of the effectiveness of inquiry based teaching modules for instructiong a group of high school physics students was conducted in 5 classrooms. Four teaching modules were tested on junior and senior level high school students. All the modules were in accordance with the South Carolina High School Science standards. Three modules utilized computer manipulation of seismic data and earth physics principles to teach concepts in physics and physical science. All students showed a significant increase of instruction knowledge for all modules. Test scores were unreliable for the modules individually. Combining the four individual tests into a single post-test for all four modules proved to have acceptable internal consistency and to show as a difference score between pre- and post-test results. The Norwegian EduSeis initiative is foremost tied to deployment of a 3-component seismograph network in schoolyards nationwide. The operational quality of our own designed Cossack Ranger stations ($2000) match those of professional instruments thus providing adequate seismic recordings also for basic research. The obvious advantages here is that schoolyard installations ensure free Internet access for data transfer (in trigger mode) to a server at the University of Bergen. This allows for timing to the nearest +20 msec removing the need for GPS clocks. To further reduce operational cotst, we require that the schools themselves install a data logger and the seismograph. One project goal is to inspire science interests among students so we are concerned about learning psychology in a competitive high school environment. First convoluted mathematics and IT-intricacies are "hidden" in a flexible data base management system (DBMS) so as not to frighten students (and teachers) but providing easy Internet access to recordings in near real time. The DBMS also provides analysis tools for filtering, zooming, etc. so the locations and estimate magnitudes (Richter numbers) for local earthquakes even from home. We encourage and cooperate with seismological oriented School Project works, (sort of high school theses) wheich have proved popular with students and teachers alike.